Hello there everyone, it´s Sanna here again with a wintery scrapbook page share today. 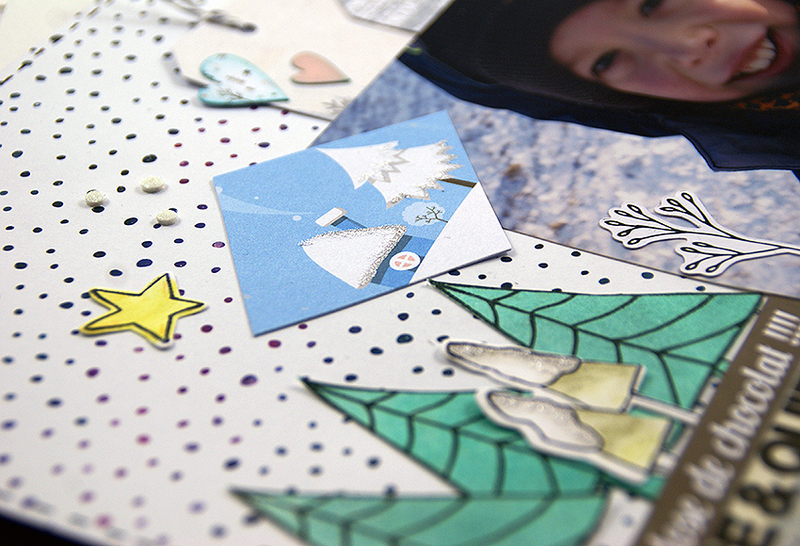 I wanted to create fun a winter themed page with die cuts around my son´s photo, who loves snow and winter. I´ve again recorded a start-to-finish video for you to watch too. 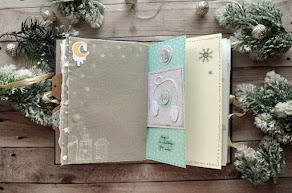 I used the Moonchild collection again for this page and even though it is very purple themed, the backsides of the papers work great for a winter theme too. And by adding some winter themed die cuts to the page the snow theme was complete. I´ve also decorated the page with some 3D foam snowflakes and microfine glitter. They add additional sparkle to the page and also add struckture to the overall look. 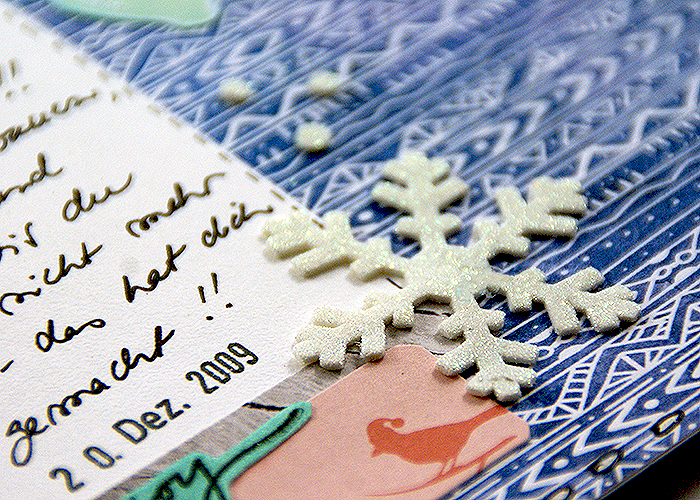 For additional fun detail and interest I misted a white leftover paper with green spray ink and then stamped some trees with the "Gifts" clear stamp set onto it (see full material list at the end of this post). 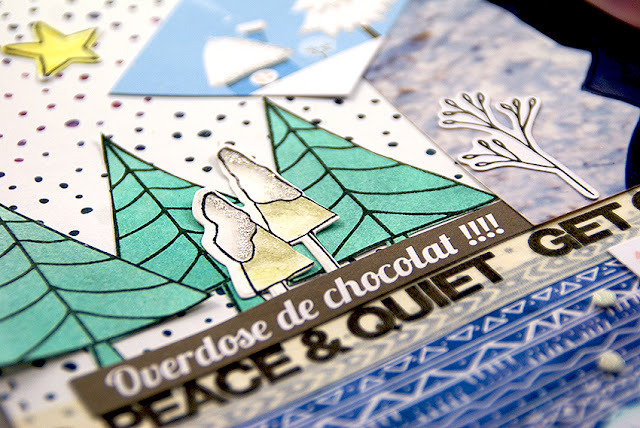 I´ve also added some leftover stamped and colored images from my previous projects to accompany the Studio Forty stamp images. Even though they are from a different series, they work really nicely together with the Studio Forty stamp designs and die cuts. 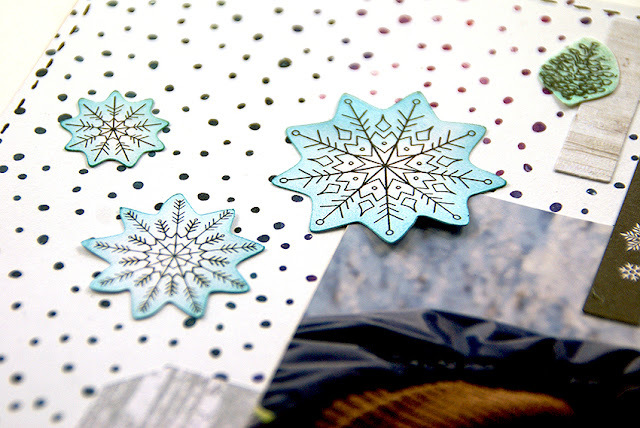 I wanted to add a frosty look to the page, so I treated some of the stamped and die cut images with glitter glue. This makes the images look like they were covered with a layer of snow. To make some die cuts stand out more from the dotted background, I inked them with blue Distress Ink. 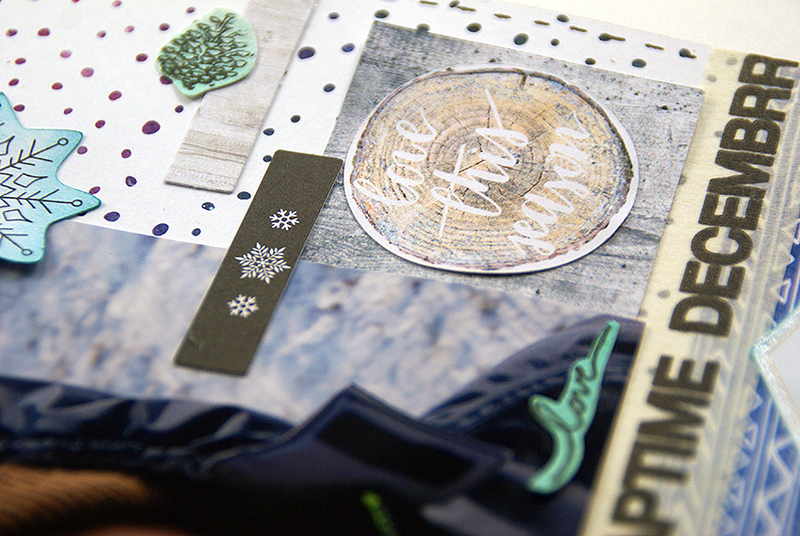 This way you can also easily change the look of a precut image to match the coloring and color sheme of your page. 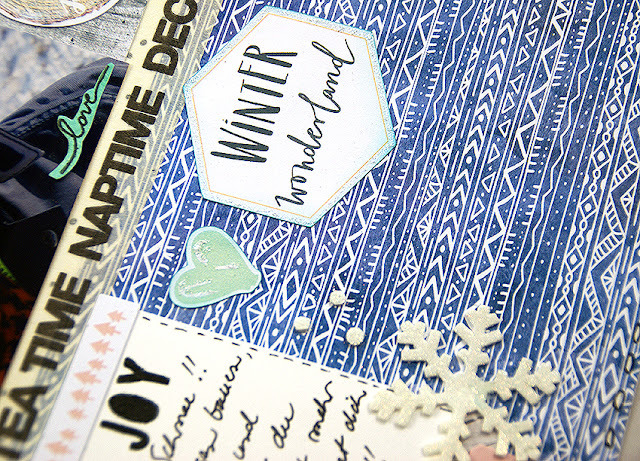 In general this page is quite simple and easy to make as you only need to adhere the patterned papers together and then add the photo and have lots of fun with all the little bits and pieces and arranging them into an order that pleases your eye. And even though there are quite a few elements on the page, it still isn´t bulky at all. It will therefore fit into a photo album very easily without taking too much space. 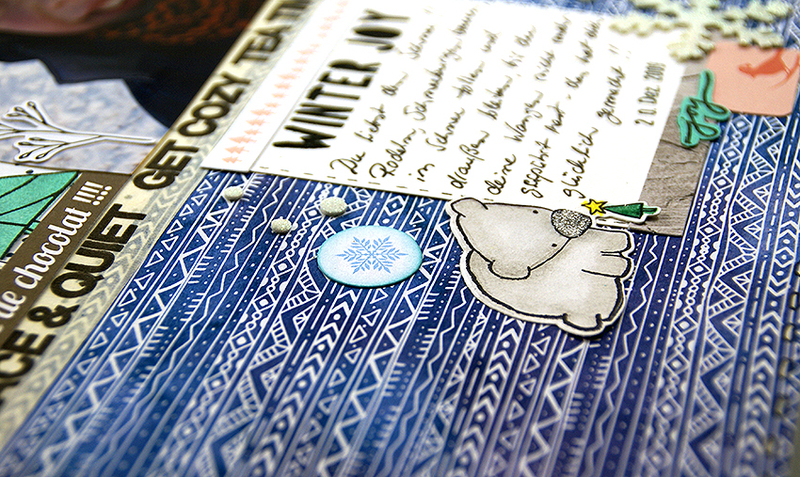 Finally I´ve created the title for this page with "Merry" clears stamps and black stamp ink. Under the title I added some journaling and also stamped a date. I´ve noticed that when you don´t immediately add the dates to the stories you scrap about, it will be impossible to recall in a few years time, when a particular photo was taken. You think you will remember, but sadly this is not the case. It is much more fun looking thru a photo album later with you children, when they can see what year a particular photo and memory is from. All right, enough of that for now. Let´s start with the video - hope you like it!!! This was my last project for this design team term, I hope you have enjoyed my little tutorials here over at the Studio Forty blog. Christmas being just around the corner, it is now time for me to wish everyone a very happy Christmas time and a very creative and inspiring 2018!! Guest Designer - Catalina Ramirez -cz 2. Zimowe zapiski... | Magda G.